I am Robert Grant, an Investigator at the Gladstone Institutes and Professor of Medicine at UCSF. I led some of the pivotal studies of pre-exposure prophylaxis or PrEP, leading to FDA approval in 2012 and CDC and WHO recommendations in May and June of 2014. 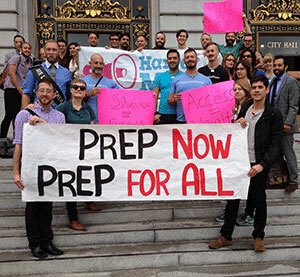 We know that PREP works when taken, we know that people can take PREP consistently, especially in San Francisco. We also know that side effects of the medication are uncommon and readily managed. We also know of multiple indirect benefits of PREP: PREP motivates testing for HIV and other sexually transmitted infections, PREP provides opportunities for vaccinations including human papilloma virus and hepatitis B, PREP engages HIV uninfected people in the struggle against this epidemic. The most powerful indirect benefit is personal: We see that PREP fosters a sense of safety that allows love to flourish between HIV infected and uninfected people. As we ponder what we should do with this new opportunity, I would like to reflect on my 30 years of work in HIV research and clinical care. As a public health graduate student in Berkeley and a medical student in San Francisco in the 1980’s, I was devastated by AIDS deaths of wonderful and beautiful people, and my having so little to offer. Every year we seemed closer to having some way of ending the horror – better diagnostics, better antiretrovirals, combinations that suppress viral load indefinitely, demonstration that such therapy blocks spread of infection to others, and now PrEP. I believe that we can end HIV transmission in San Francisco. This will require that we fully use what we know. San Francisco has one of the best HIV testing and treatment rates in the world, which as reduced new infections since 2007. Yet we have to do more as there continues to be more than one new HIV diagnosis per day in San Francisco. PREP is underutilized. The CDC estimates that 500,000 people nationwide could benefit from PREP, and that utilization on that scale would stem the spread of HIV. I estimate that there are still fewer than 1000 people receiving PREP in San Francisco, while there might be 10,000 who would benefit. The barriers to PREP utilization in San Francisco are clear: There are too few nurses and doctors who provide of PREP, there is too little information among potential users, there are gaps in insurance coverage, and what insurance coverage is available is complex and changing every year. These barriers to using what we know about PREP can be addressed with health care navigators with special expertise in insurance coverage, health care provider training, consumer education, and a safety net for medication access. Why act now? There are several reasons. We should act now because HIV continues to spread in our community, disrupting our lives, our relationships, and our work. We have a new opportunity. CDC and WHO recommendations were issued as recently as May and June 2014. We now have the public health authority and guidelines required for broad implementation. Last month, a new nationwide PrEP providers hot line was started. Funded by the CDC to UCSF, through HRSA, this hotline is emblematic of national and local leadership. Providers who have questions can call and get guidance and information. The manufacturers’ programs for access to PREP have never been better, although they are still not good enough. As of October 15, 2014, Gilead’s patient assistance program is available to whose income is less than 500% of the federal poverty level, if they do not have insurance. If they have insurance, copayment assistance is available to offset up to $300 a month. These program expansions were driven, in part, by political leadership from San Francisco. More program expansions are needed because there are people with insurance that only covers catastrophic illness, and not prevention care. Public leadership is needed to bring still better programs in the public and private sectors. We have new study results. Just last week, we learned that the PROUD study in the United Kingdom had showed that offering PREP immediately dramatically reduced the numbers of new HIV infections. The safety committee of that study ordered that all participants in that study be offered immediate access to PREP. Consumer demand for PrEP is increasing. PrEP is being provided at Kaiser San Francisco, the VA infectious disease clinic, UCSF 360 clinic, the SFGH Family Health Center, the SFGH Bapac clinic, and in some private practices. The San Francisco AIDS Foundation plans to start PREP services at their Magnet center in the Castro. Expanding PREP access within the Community Health Network will be important too. The world looks to San Francisco for leadership in interventions, research, and grassroots movements in response to HIV. What happens in San Francisco does not stay in San Francisco. We have an opportunity to lead San Francisco to become the first city to end HIV transmission – and others will follow.